"A magnificent, one-of-a-kind animated film." Sony Pictures Classics has debuted a brand new US trailer for the animated film The Red Turtle, directed by Dutch filmmaker Michael Dudok de Wit with help from Isao Takahta at Studio Ghibli - they also co-produced. This beautiful film premiered at the Cannes Film Festival, where I fell in love with it and wrote a glowing review. There's no dialogue at all, but it has a tremendous score by Laurent Perez Del Mar. 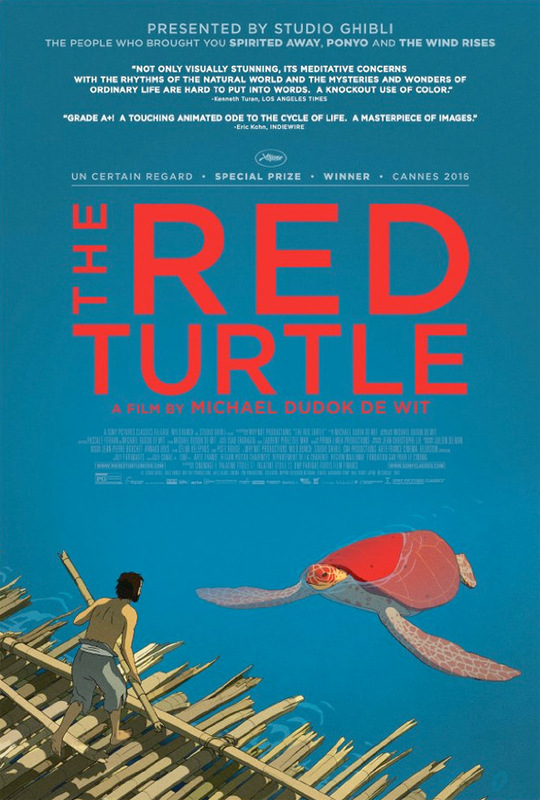 It tells a simple story of a man who washes up on a desert island trying to escape, but every time he tries to a red turtle thwarts his efforts. It becomes a very moving metaphor for the cycle of life, and this trailer shows more of where it goes in the second half. My quote from my Cannes review appears in this trailer and I'm very happy to support this wonderful animated film. Enjoy. The description for The Red Turtle calls it a "fantastical tale" about a "man marooned on a desert island whose attempts to escape on a raft are thwarted by a giant turtle that sinks the makeshift craft." Dutch filmmaker Michael Dudok de Wit is directing and co-wrote the screenplay with French director Pascale Ferran, best known for Lady Chatterley and Bird People. As exciting as it is knowing that Studio Ghibli is involved, this isn't exactly a "new Ghibli movie". The original reports (via Kotaku) stated that Dudok de Wit temporarily relocated to Tokyo to finish the story and storyboards, with Ghibli's Isao Takahta overseeing everything. However, the film was finished being animated in France, not in Japan. This first premiered at the Cannes Film Festival (read my review) and played at the Melbourne and Toronto Film Festivals, with Fantastic Fest next. Sony Classics opens The Red Turtle in theaters starting January 20th, 2017 next year. A far cry from the animated excellence of Studio Ghibli's past, but for what it is, this looks very good. Whenever I watch MONONOKE HIME-SAMA, I am reminded at how great this studio was. The loss of Miyzaki-san (from the studio) and the eventually loss of the studio itself was one of the greatest modern blows to cinema. Just a note... While Studio Ghibli is involved in this, this is NOT a Studio Ghibli movie. Ghibli's involvement was mainly during the development stages and in creative aspects, but the animation was done in France and it's directed by a French filmmaker. Obviously they want to sell it as "Studio Ghibli presents" but I hope people don't get confused because this is NOT a Studio Ghibli movie. Yeah, I knew that. Thanks for clarifying for others. It just reminds me of how impactful the loss of Ghibli was for me. Hey Alex, you got a quote on there! The style really reminds me of French BD comics, hadn't watched the last Ghibli movie, but will give this one a go I reckon.